EAO HMI Systems Meet the Demands of Harsh Environments » HHP Associates, Inc.
SHELTON, Conn., March 2018 – EAO, the expert partner for innovative, intuitive and reliable Human Machine Interfaces (HMIs), offers custom-built HMI Systems and a full range of internationally recognized HMI Components ideal for use within industrial automation equipment or machinery for harsh environments. As an expert in the design and integration of reliable HMI Systems, EAO translates both market and application requirements into intuitive and innovative operator interfaces custom designed to meet stringent customer demands. EAO can design and manufacture all types of control panels or input devices – from primary on-off controls and simple membrane keypads, to handheld remote controls and highly complex rugged interfaces. HMI Systems can feature and benefit from the use of a “mixed technology” approach that incorporates combinations of discrete switches, displays, touch screens, electronics and serial bus connectivity when needed. 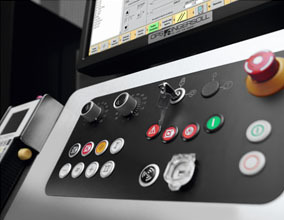 Expertise in front panel material selection and marking technologies allow EAO’s HMI System’s to succeed in all types of demanding environments. All aspects of the HMI development process are supported; from design, concepts and prototyping, to full manufacturing and just-in-time delivery. EAO also offers a complete range of HMI Components available worldwide that are manufactured to meet required international standards including UL, cUL, CE, RoHS, CB – EN/IEC 60947-5-1, NFF 16-102, CSA, CCC, GOST, and German Lloyd (see individual products).